The North Liberty Global GNSS Station (NLIB) has been operating with the same AOA choke ring antenna since March 5, 1993. This is one of the longest running core reference frame stations. The antenna has begun to show signs of degradation and the JPLA dome was shattered sometime last year, both must be replaced. In order to replace the existing antenna with a calibrated antenna/dome combination, a new mounting system had to be devised as well as robot calibration results obtained for the phase center prior to any antenna/dome changes. A recent trip was made to the station in order to setup a campaign system to log data on the "North Liberty 1987" NGS mark. 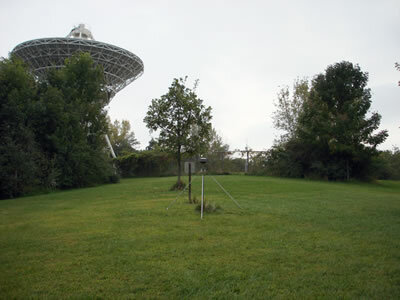 This mark is located approximately 100 feet outside of the fence that surrounds the VLBA antenna. The campaign system is a Tech2000 mast, Topcon CR-G3 choke ring antenna, and a Ashtech MicroZ reciever which is logging daily files. This data will be used for a site tie once the values for the phase center have been received from the robot calibrations being conducted at Geo++ currently. We hope to have the results from the calibration within the next few weeks. Figure 1 - Tech2000 mast setup on "North Liberty 1987" NGS mark (NLIB). 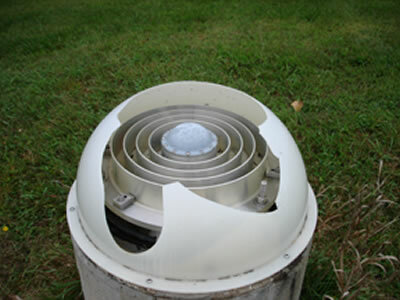 Figure 2 - Shattered dome at NLIB.